There’s a lot to be said for thinking outside the box. Without people willing to bend, stretch and break established rules, we’d be living in a very dull world. For example, we’d probably all be dead because no one had dared inject themselves with small pox. More importantly, we wouldn’t have PC mods that turn ordinary sniper sims into intense, zombie-perforating horde modes, either. 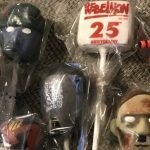 Rebellion’s Zombie Army titles began life as tongue-in-cheek distractions, but quickly became as popular, if not more-so, than the Sniper Elite games they piggy-backed in on. 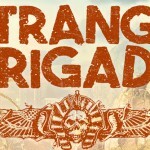 Essentially, the premise distills everything you learn and do in the primary SE campaign, and transports it to the killing fields of World War 2 during a zombie apocalypse caused by Hitler, the dickhead. 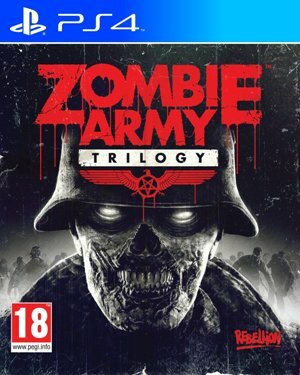 The trilogy contains both original Zombie Army games and a previously unreleased third outing, and equates to 18 missions across the three episodes, as well as an endless horde mode. 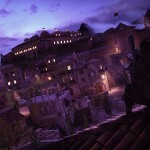 The whole game is open from the off, and can be played solo or with up to three other snipers. To facilitate the focus on co-op, the previous guy-only character line-up is bolstered by the addition of four female shooters. The stats are all the same, so the choices are purely cosmetic; you can even alter your loadout from the entire arsenal before each mission. The mission structure is simple enough. You begin at point A, and must get to point Z, while reaching arbitrary checkpoints at every other point along the way. 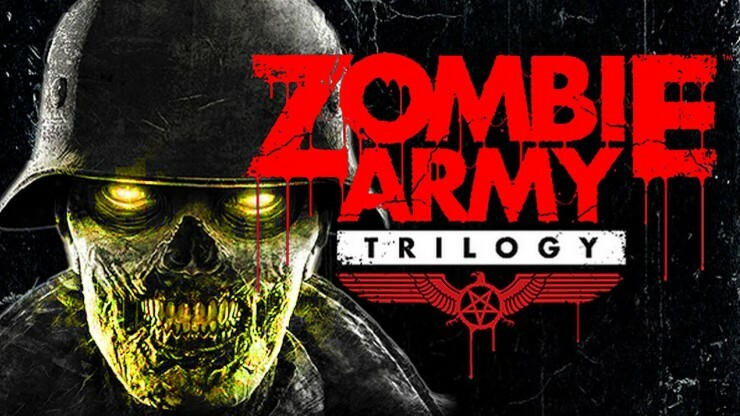 Sadly, Zombie Army Trilogy’s missions are far too long, some lasting 30 to 45 minutes. It’s also not afraid to reward your survival by throwing almost unstoppable, machine gun-wielding super zombies at you in the final act of a mission. Honestly, it’s like fighting the Nemesis with WW2-era guns. The intense, co-op focused action cries out for snappier missions, and Zombie Army Trilogy’s over-long, over-stuffed outings can become grating when you’re told to defend the area for the sixth time in a single mission. It makes every mission feel like a series of horde modes with very little variety. Now and then it attacks you with skeletons, or super-soldier Nazi snipers, or huge brutes, but it’s always fairly formulaic. 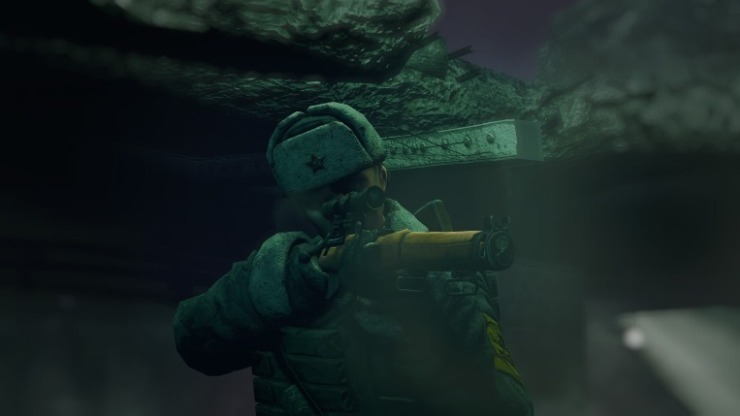 Zombie Army’s greatest asset is its stylistic approach to sniping. The slow-motion x-ray kill-cam is just as cool here as it is in Sniper Elite, only this time it’s slowing down the advance of a zombie horde to show you a super-slow-mo skull excavation in all its shiny, gory glory. The big difference now is that once they get within a certain distance, it becomes necessary to whip out the shotgun or machine gun and fight your way clear. Kicking them down and stomping their heads is fun, but won’t get you far, but it is one of those games where you feel somehow badass running out of ammo and having to pull your pistol to stay alive until the next safe room. It’s the survival that does, a staple of zombie games that feels right at home here. As with most games that allow co-op, Zombie Army Trilogy is better with friends. The tougher enemies go down easier, and it’s just nice to have someone else there when it gets really hairy. This is especially true of the horde mode, which necessitates teamwork at all times. Surviving alone is often a losing game. Where Rebellion’s novelty adventure truly shines is the stand-offs: when you’re dug in and the horde is coming, you’ve set landmines, trip wires and conveniently-placed dynamite, when your ammo is full and your blood is up and you just have to keep shooting. The right bumper enters focus mode and makes long shots easier, but it’s hard to take your time when they’re shambling towards you in scores. 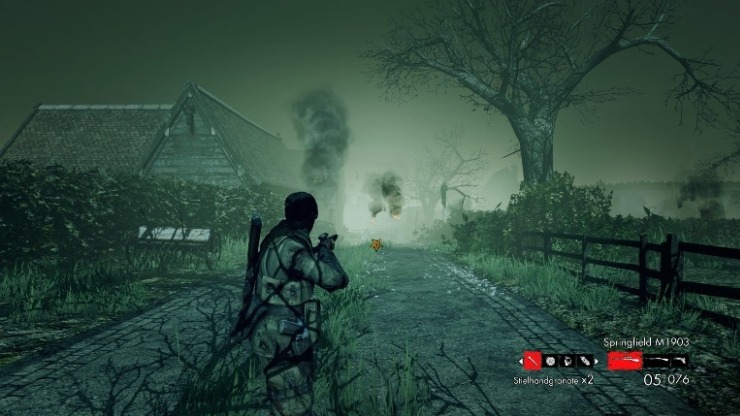 The atmosphere is bang-on: low pockets of mist hide advancing zombies, tree limbs form angular demons in the distance and lightning flashes grant terrifying clarity as you stare down your doom. It’s a shame that zombies will occasionally get stuck on scenery and the animation is often decidedly janky. Still, the immersion is undeniable when you’re squinting through the scope, and the DualShock 4’s speaker is producing horrible, spooky chatter at you. 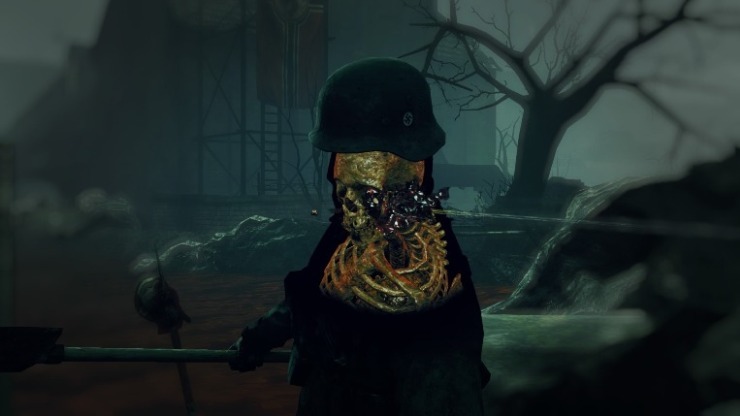 Zombie Army Trilogy is a fairly pure example of what it is. It’s a game about sniping zombies that doesn’t clutter up proceedings with things like plot and characterisation, and doesn’t ask you to do anymore than shoot zombies in the head. It’s a guaranteed cult hit that offers some of the best precision zombie execution of the generation so far.